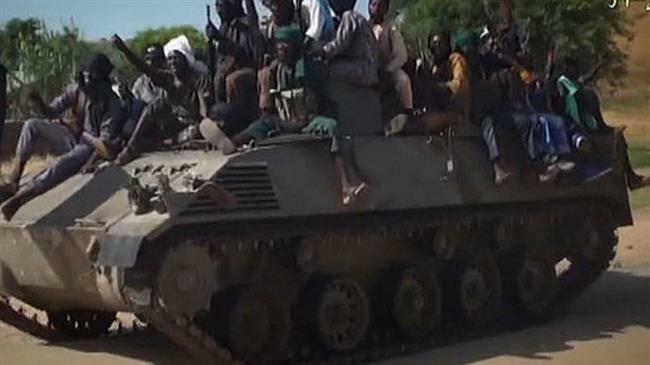 Boko Haram bombers have killed at least four civilians after fighting broke out on the outskirts of northeast Nigeria’s biggest city, Maiduguri. Media reports said on Friday that the militants were trying to reach the city’s Giwa Barracks, where other militants had been imprisoned, when they were stopped by security forces. Boko Haram rarely attacks urban areas. However, it is believed that more than 100 militants were involved in the attack. The police said Thursday’s attack was repelled “after a fierce gun battle” and firing of tear gas. Two officers were injured while seven others were also wounded, Major General Lucky Irabor said. The attack was repelled with the arrival of reinforcements. Boko Haram terrorists were pushed back to Alidawari area near Maiduguri. At least one member of security forces was reportedly killed when a bomber detonated his explosives near a military vehicle. “There were innocent citizens, four of them, who died,” said Bashir Garga, a member of the Maiduguri National Emergency Management Agency. The Borno state police gave a lower death toll of two, including a member of the civilian militia assisting the military with security against Boko Haram. However, the recent attack in Maiduguri alongside an announcement that 22 soldiers from a joint regional force made up of troops from Nigeria, Chad, Benin, Cameroon and Niger had been killed in fighting this month once more revealed the continuous security threat that Boko Haram militants still pose in the region. The nationalities of the dead troops were not disclosed. Boko Haram attacks are a challenge to President Muhammadu Buhari’s declaration that Boko Haram has been “technically” defeated.